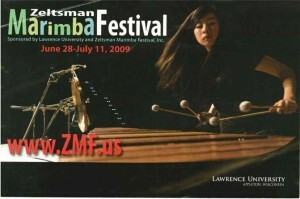 Tuesday I received the Zeltsman Marimba Festival 2009 brochure in the mail. I attached it here because it has some very nice photography work by Claudia Hansen. Trivia question – which piece is being played in this photo (it appears to need a marimba, gong and triangle) and what is the name of this marimbist? I actually don’t know the answer to either question but please post comments if you do know! I have a lot of practing left to do on the three pieces that I will have “ready” to play. Currently that list is going to be “Nancy” by Emmanuel Sejourne, “The Offering” by Michael Burritt, “Etude #3” by Gordon Stout. The next interactive learning piece is “Katamiya” by Emmaneul Sejourne so I will also be spending some time with that. It is doubtful I will have it fully ready for the festival but I am going to try! I now know the answer to both parts of the trivia question above. For the first person who can come up to me at ZMF and tell me the answer I will give you my extra Marimba One hat.